Wearing a copper ring or Tambe Ki Anguthi on your finger has been widely prescribed by the practitioners of both Ayurveda and Traditional Indian Medicine and Jyotish Shastra. This simple and cheap ring is attributed with powerful medicinal and astrological properties and can prove to be a useful and cost effective home remedy. 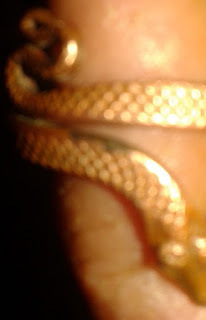 The copper ring can be of any shape, some people wear Naag or Snake shaped copper rings, which are infused with specific Kaal Sarp Dosh Nivaran Mantras for off-setting the malefic side-effects of this astrological Yog in their horoscopes. The copper ring is also said to be beneficial in getting the auspicious effects of the Planet Sun and removing any malefic effects of this most powerful planet. Hence, Surya Mantra Abhimintrit copper rings are normally worn on the Ring Finger or the Anamika Ungli. Those, who do not have much faith in astrology can simply wear it for it’s medicinal properties, like keeping the Blood Pressure under control. The copper ring is a simple and cheap home remedy for people suffering from Low Blood Pressure. It also removes the swelling from the body, which is attributed to Low Blood Pressure. The copper ring is also said to be an effective home remedy in getting relief from stomach related ailments, like indigestion, acidity and recurring pain in the stomach, including the pain resulting from excessive accumulation of gas. The copper ring is said to remove impurities in the blood and increase the resistance power of the wearer against most infections and diseases. It is also said to remove excessive heat from the body and maintain the body heat at optimal levels and keep the mind and body calm and composed. Apart from what is mentioned above, the copper ring is said to give good results in getting relief in reducing pain in bone related diseases like, arthritis. Note- As mentioned in this post, the copper ring is a very cheap home remedy for certain ailments and astrological problems, you can try it along with your regular medical or astrological remedies mainly as a home remedy for enhancing the power the remedies, which you are already practicing. Where can I find this Sun mantra abhimintrit Copper Ring in Mumbai? Also one humble request to come up with posts on more rings for other planets such as Venus, Moon, Mars, etc. In ur upcoming posts Sir. I used to wear a copper ring in my right ring finger which was not tight at all but after a few days I noticed that most distal interphalangeal joint of the same finger ie right ring finger got swollen and painful with copperish tinge.I could not understand the reason thereof but when the situation gone beyond my control,I removed the copper ring and everything gone right ie no swelling,no pain,no copperish tinge.Till date,I fail the understand as to what was it?